I am back in Vietnam! Who would have guessed I would have ended up teaching English here? Phase two of the TESOL course was teaching practice and Vietnamese language lessons (Vietnamese is the hardest language ever. It is tonal). I have now completed the TESOL course and a few job interviews lined up. Last Friday Zach, Kyle, Alex and myself moved into a five bedroom house one block from Nam Ky Khoi Nghia Street. Learning to say our street name so our xe om (motorbike taxi) driver knows where to take us is turning out to be very challenging. We will need to keep practicing. Our house is huge with four floors, two bedrooms on each floor and a roof top terrace. Our living room is also the garage. Once we all get motorbikes we will park them next to the tv. The front door is a huge gate that opens all the way up. We have a little pad lock that locks it all up. You have to stick your hand inside a small hole and then try and fit your key into the lock without looking and with one had. I have yet to master this. So far our neighbors are very welcoming and there are lots of banh mi sandwich stalls. 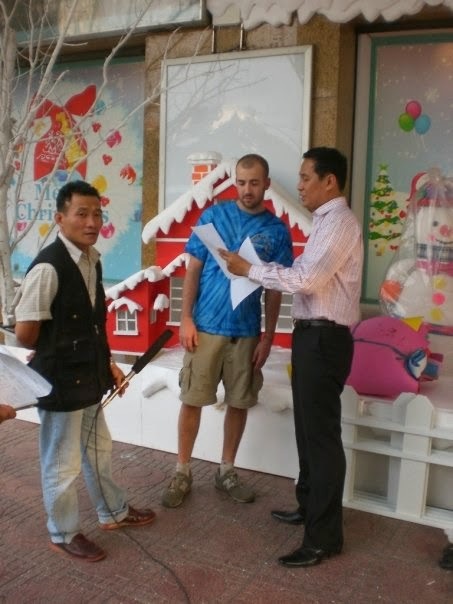 The other day we were walking around downtown Saigon and we were asked by a local tv station if we would stop and read some English words for the camera. It was a tv show that teaches country children English. I read "the suitcase is over there." I guess the country children are taking a trip on a plane. So a little local tv fame to start off our year in Vietnam!